Article 16 of the present Constitution states that all existing law at the time the Constitution was promulgated remains valid notwithstanding any inconsistency with the fundamental rights chapter of the Constitution. This Article prevents judicial review, i.e. 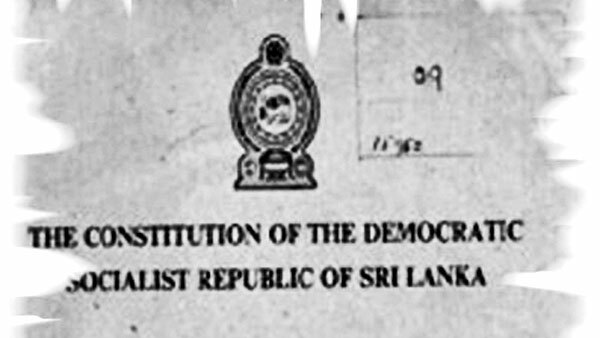 scrutiny by the Supreme Court, of laws in existence before 1978 even if they violate Constitutional guarantees on fundamental rights, including equality and nondiscrimination. There are many pre 1978 laws that violate fundamental rights that have not been reformed by Parliament and our legislators even during the long period of 38 years since the 1978 Constitution was adopted. Many of these laws are discriminatory of women and other social groups and include laws relating to land and criminal law. A significant body of law that also continues to remain valid is the diverse personal laws that are applicable in Sri Lanka and which apply mainly in the areas of marriage and inheritance. Two of these systems of personal law, i.e. Kandyan law, applicable only to Kandyans, and Tesawalamai law, applicable only to Tamils of the Northern province, are not religion based. Further, in their present form they have no link to their original customary or traditional roots as they have been significantly altered by British colonial legislation and court decisions that have superimposed ideas borrowed from Roman Dutch Law on these systems, and diminished the rights of women of these communities. Only the personal law of the Muslim community is based on religion and is derived (in some respects) from Islamic Law. All these systems of personal laws discriminate against women and need to be urgently reformed. It is therefore critical that the new Constitution repeals Article 16 and provides for judicial review of all the laws that violate the new Constitution. While the constitution must continue to guarantee the freedom of religion as part of general guarantees on fundamental rights of the people, it must also guarantee equality by providing room for discriminatory clauses of laws that are inconsistent with the bill of rights to be amended or not enforceable. The new Constitution will undoubtedly incorporate the legitimate right of the State to enact laws and policies on manifestation of religion that infringe fundamental rights guarantees. These limitations must conform to the norms already incorporated in our Constitution that will be further clarified, in harmony with accepted norms on implementation of human rights in the public interest. Consequently, practices that discriminate against Muslim women must be modified by the State, but in consultation with the Muslim community. The community consists of both men and women and the voice of the women must be heard. The present Constitution, following the Indian Constitution, only recognises that State violations of civil and political rights, (for example, the right to be protected from torture and illegal arrest and the right to equality) can be challenged in the Supreme Court. Socio-economic rights are not given the same status as civil and political rights as they are considered to be issues of social welfare policy decided at the discretion of the State. Thus, while the Constitution declares that the State is pledged to establish a social order in which social, economic and political justice shall guide all the institutions of national life, and the realization by all citizens of an adequate standard of living, such provisions have been relegated to the chapter on Directive Principles of State Policy, and are not justiciable. Yet, social and economic rights including the right of access to health and education in State/ public institutions has been recognised as the right of all our people since the 1940s, due to the visionary policies introduced by our early political leaders. Today these are considered peoples’ rights despite the absence of Constitutional guarantees or legislation. We have all witnessed the crisis in these sectors due to the failure to increase and allocate adequate budgetary and human resources to maintain and enhance them. At the same time Sri Lanka’s continuing positive social indicators for the people, in both the areas of health and education, have been consistently traced to the investment in public education and health from the pre-independence period. It is critical that the negative changes that we have witnessed in recent decades, and the reduction in allocated resources are arrested. Recognition of socio-economic rights in the new Constitution is one way of ensuring budget scrutiny and accountability in the use of national resources in the public interest, instead of fiscal profligacy and waste of public funds. Socio-economic rights such as access to the highest available standard of health care, education at primary, secondary and tertiary levels, and other basic needs such as food and water, housing and shelter must be considered basic rights of all the people, to enable all Sri Lankans to access these “public goods” and share the dividends of economic growth and development. This does not mean that we should not recognise a public/private mix in these areas, and discourage or prevent the involvement of the private sector. What this will demand is responsible allocation of public funds by the State for these sectors, even as the private sector provides alternatives, and is regulated by the State to ensure high quality of services. Current global developments reflect the shift towards incorporating socio-economic rights in Constitutions. The recent multilateral UN treaties, many of which Sri Lanka has already signed on as a State Party, give civil and political rights and socio-economic rights equal status as justiciable and enforceable rights of the people. This development incorporates the international consensus in Vienna in 1993, which recognized that all these rights are indivisible and interdependent. The same concepts on socio-economic rights are reflected in global policy documents that Sri Lanka has endorsed over many decades since 1978.
International agencies that this country has worked with like WHO and UNICEF have also supported national and provincial programmes in recognition of these treaty norms, global policies and local agendas. The most recently accepted Sustainable Development Goals (SDG) agenda which sets the benchmarks for progress of nations and creates commitments for governments for the next 15 years recognises socio-economic rights in the above areas, and expects that governments will implement them. The SDG agenda also focuses on the aspect of financing to ensure that SDG goals and targets are implemented. It is also pertinent to clarify that some 70 countries have, in the last two decades incorporated socio-economic rights into their Constitutions, and considered their recognition and enforcement through the courts in the public interest. These countries include those with Common law systems, like South Africa and Kenya, and those with civil law systems such as Bolivia and Ecuador. The Indian Supreme Court has over the years overcome the limitations on the non- justifiability of socio-economic rights through judicial interpretations, and these pioneering judgements have also influenced other courts, including in South Africa and Nepal. The jurisprudence in our courts has on occasion tried to recognise the rights of the people in areas such as environmental protection, but the Constitutional imperatives have been a limitation. Those who argue against recognition of socio-economic rights suggest that it will result in an erosion of the separation of the legislature and the courts as it will give the courts the power to question government policy decisions on development and economic growth. They argue that this must remain the proper domain for lawmakers in Parliament and the Executive. However when these institutions fail as custodians of the public good, there must be an agency that promotes accountability and ensures the rights and welfare of the people. The experience of other countries with Constitutional provisions on socio-economic rights indicates that clear drafting of such provisions, using concepts such as “proportionality”, “reasonableness", “within available resources”, “allocating maximum available resources” can, and have ensured that the courts do not exercise open ended discretion. Cases decided in Indian and other courts demonstrate that extremely expensive procedures and facilities are also not considered the type of resources that the public systems must regularly provide. The argument of “affordability” cannot be used to prevaricate on providing the basic needs of the people. Indeed, even the implementation of civil and political rights which governments are committed to realise today, require allocation of adequate resources and financial provision. Law enforcement is prejudiced by failure to allocate resources. Socio-economic rights enforcement requires the same accountability as in the implementation of other rights. Lack of faith in the competence of the Courts to perform their role cannot be addressed by limiting their powers but by using the new Constitutional reforms to create an environment for a qualified and independent judiciary. We can no longer afford to leave the task of allocation of national resources to benefit the people to the legislature and the executive without some oversight of their accountability. Prof. Savitri Goonesekere, Bishop Duleep de Chickera, Prof. Arjuna Aluwihare, Shanthi Dias, Dr. A.C. Visvalingam, S.C.C. Elankovan, Chandra Jayaratne, Priyantha Gamage, Dr. Upatissa Pethiyagoda, Ananda Galappatti, Dhammapala Wijayanandana, Faiz-ur Rahman, Prashan de Visser, Prof. Gameela Samarasinghe, Dr. Devanesan Nesiah, Rev. Dr. Jayasiri Peiris, Prof. Gananath Obeyesekere, Pulasthi Hewamanna, Daneshan Casie Chetty, Prof. Ranjini Obeyesekere and Suresh de Mel.